The graph below gives information from Annual Energy Outlook 2008 about consumption of energy in the USA since 1980 with projection until 2030. 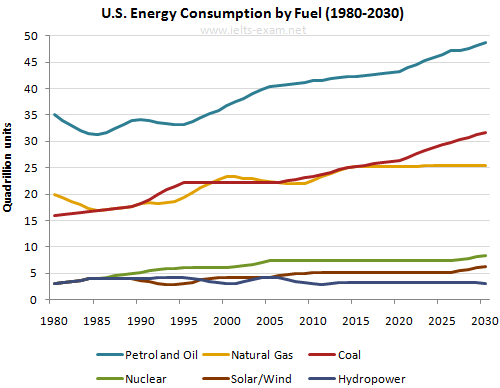 The graph shows consumption of energy in the U.S. since 1980 with projections through 2030. The historical trends show Petrol and Oil as the major sources of fuel, rising from 35 quadrillion (35q) units used in 1980 to 42q in 2012. Despite some fluctuation between 1980 and 1995, there was a steady increase, which is expected to continue, reaching 47q in 2030. Consumption of energy from natural gas and coal followed a similar pattern over the period. From 20q and 15q respectively in 1980, gas showed an initial fall and coal a gradual increase, with the two fuels equal between 1985 and 1990. Consumption has fluctuated since 1990 but both now provide 24q. Coal consumption is projected to rise to 31q in 2030, whereas after 2014, natural gas is forecast to remain stable at 25q. In 1980, energy from solar/wind, nuclear, and hydropower was the least-used, with only 4q. Nuclear has risen by 3q, and solar/wind by 2. Since 2005, hydropower has fallen back to the 1980 figure. It is expected to remain approximately constant through 2030, while the others are projected to rise gradually after 2025. Overall, fossil fuels will remain the chief energy source for the US, with a little bit of hydroelectric, nuclear and a smidgen of renewables like wind and solar.